PSV and Ajax will represent the Dutch in the Champions League and it doesn’t get much tougher than an away trip to the Nou Camp for Marc van Bommel’s side. Will Burns previews early Tuesday evening’s huge tie. This will be the first clash between Barcelona and PSV for over 20 years and what a daunting task this will be for Marc van Bommel as he returns to the Nou Camp as a head coach. However, his side travels to Spain in incredible form. The Eindhoven side has won their last seven games in all competitions scoring a staggering 27 goals and conceding five including a 7-0 win away to ADO Den Haag last time out. The firepower of Gaston Pereiro, Steven Bergwijn, Luuk de Jong and Hirving Lozano have been responsible for notching twenty of the aforementioned 27 goals, and despite the gulf in class in the standard of teams, Barca will need to beware of the PSV forward line. Barcelona themselves are on a winning streak of five, but this past weekend that record was in jeopardy. Real Sociedad hosted the first game in their newly refurbished Anoeta Stadium and led for the majority of the game after taking a 12th-minute lead from an Aritz Elustondo volley after Barca failed to clear a free-kick. Similarly to how I envisage PSV to attack, although they have much possession, Sociedad looked dangerous on the counter, and Barca found this difficult to manage at times and their possession lacked any kind of penetration in the first 45 minutes. Meanwhile, after a frustrating first-half, coach Ernesto Valverde switched Sergi Roberto into full-back after the break as Phillipe Coutinho replaced Nélson Semedo and the former Liverpool man was influential in turning the game around. 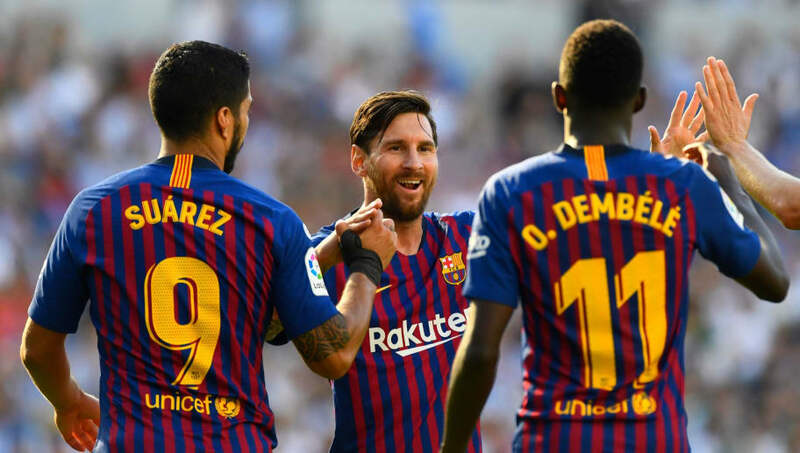 The entrance of the Brazilian gave Barca a faster movement in possession and former Ajacied striker Luis Suarez and Ousamma Dembele notched to clinch a close fought win. For the best bet in this one, I cannot look past a home win, however; the scorers of 27 goals in seven games, PSV, like Sociedad this past Saturday, are more than capable to grab a goal. Valverde experimented with his midfield this past weekend but look for him to select his strongest side with tunnel vision on the Champions League this season. Sergio Busquets and Coutinho were left out of the starting line-up, but they should come back in alongside Ivan Rakitic. Not one to use much rotation, Van Bommel fielded a strong eleven at the weekend, but Erick Gutierrez has made a claim to start. The newly signed Mexican midfielder impressed from the bench on his debut scoring and creating another in the 7-0 victory against ADO.